, we’re working daily to boost speeds across the Lone Star state. And starting today, we’re exploring the possibility of bringing Google Fiber to Dallas as well. If we’re able to bring Google Fiber to Dallas, it will mean more than a reliable connection. It will mean new ways for families to stay in touch and stream their favorite shows, and new opportunities for businesses—especially businesses in Dallas’ budding tech sector—to grow and be more productive. With Fiber, businesses can download files in seconds rather than hours, communicate faster with customers, and much more. Dallas is already one of the best cities to work in tech. Google Fiber will help Dallas attract even more tech talent, and push the city further toward the future. Bringing Google Fiber to Dallas would be a huge undertaking, so we want to make sure we’re prepared. Working alongside Mayor Mike Rawlings and local leaders, we’ll use our Fiber checklist to learn more about local topography, existing infrastructure, and other factors that may impact construction. Building a fiber optic network through a dense and complex urban environment like Dallas is challenging—these discussions will help us deploy our network efficiently and responsibly. We look forward to working with Dallas’s leaders as we explore bringing Fiber to their city. It’s still early days, but we’ll keep residents updated as we approach our decision. To receive the latest news on Google Fiber, head to google.com/fiber and sign up for updates. 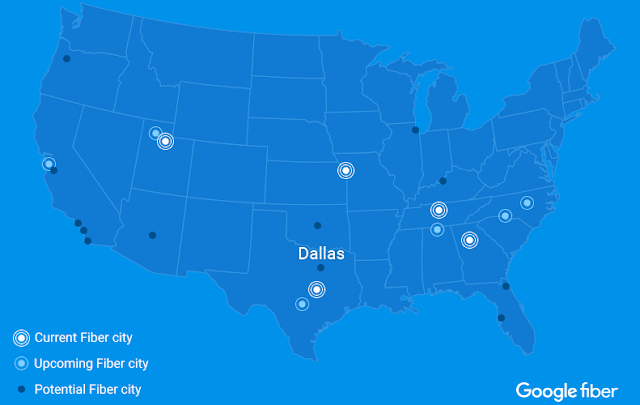 For the past three years, Texas has been a home to Google Fiber. Whether we’re connecting families and businesses to superfast Internet in Austin, or building over 4,000 miles of fiber in San Antonio, we’re working daily to boost speeds across the Lone Star state. And starting today, we’re exploring the possibility of bringing Google Fiber to Dallas as well. on how access to ultrafast Internet can boost the value of multi-family homes. There are a slew of successful TV shows that follow people who are searching for a new home. Each show follows the same formula: seekers must decide between a few properties, debating the merits of various amenities, neighborhoods, and price points. Savvy producers have discovered we love to see people navigate the complex process of deciding where to live. One factor that is increasingly having an impact on those decisions: access to ultra-high speed, reliable broadband. We have concrete data that shows access to fiber increases the value of single family homes. But what about the almost 30 percent of people in the US, both renters and owners, who live in multifamily housing? In a new study the Fiber to the Home Council is releasing today, we find fast and reliable broadband is now rated the single most important amenity for multiple dwelling units (MDUs). In addition to finding ultra-high speed broadband to be more important than a pool, 24-hour security monitoring, covered parking, gym access and even cable TV, these results also show that MDU residents believe fiber-based broadband is significantly faster and more reliable than other technologies. Our research also shows that MDU residents are willing to pay more to live where there’s fiber. People were willing to pay 2.8 percent more to purchase a condo or apartment with access to fiber optic service (based on a $300,000 home). For renters, it’s even more important. Respondents were willing to pay a premium of 8 percent (based on a $1000 monthly rent) for access to fiber. People who live in MDUs also want access to multiple providers, ranking provider choice as 6 out of 12 possible amenities. While these numbers are based on all types of fiber-to-the-home, based on our other research and anecdotal evidence, values could be even higher for gigabit fiber service. What do higher rental and sales values mean to MDU owners and operators? A better bottom line. Using data from the National Apartment Association, we estimate fiber can add 11 percent in net income per average apartment unit. And our findings show that fiber access increases resident satisfaction and appears to reduce churn, helping building owners and operators maintain high levels of occupancy and provide a quality living environment. Access: MDU owners can assist by making buildings accessible while the fiber industry continues to make advancements in deployment methods and technologies that reduce any potential disruptions to residents. Education: We at the Council will continue to work with our partners to promote the value of a future-proof technology that increases the attractiveness of properties in an increasingly competitive housing market. Ed. Note: Today, we have a guest post from Heather Burnett Gold, President of the Fiber to the Home Council Americas, and Michael Render, Principal and Founder of RVA, LLC. They are sharing the findings of a new research report on how access to ultrafast Internet can boost the value of multi-family homes. TM—the same technology behind Chromecast—right into your Fiber TV Box. Google Cast gives you access to thousands of apps, right on your TV screen. That means you can seamlessly enjoy the best of online entertainment and TV without changing inputs. At the click of a button, you can watch the Game of Thrones premiere on HBO, then head to Netflix for the latest season of House of Cards. You can DJ your party with Pandora, then scroll through pictures with friends using Google Photos. You can watch and listen to everything you love, whenever you want. Casting is easy. Just connect your compatible mobile device or laptop to your Fiber Wi-Fi, then tap the Cast button from the apps you already know and love to send what you’re viewing to your TV. And since Fiber TV comes with Google Cast technology built-in, no additional equipment or setup is needed. Over the coming weeks, we'll start rolling out Google Cast on Fiber TV to all our TV subscribers. You can learn more at our help center. Get ready for more season premieres, movie screenings, karaoke nights and more—all on your big screen. From channel surfing to streaming, there are more ways than ever to find and enjoy the entertainment you love. We want to help you access all of your favorite shows, movies, music, and more. So starting today, we’ll be adding Google CastTM—the same technology behind Chromecast—right into your Fiber TV Box.